From Laney Mackaben, 10, Newell, S.D. Morgan Mackaben, 8, Newell, S.D. After the storm Atlas, the Mackaben family from Belle Fourche, S.D. – dad and mom Chad and Shawnie, son Clay and daughters Laney and Morgan were contacted by their county agent Betsy Burtzlaff about an essay contest. A generous young man from Lusk, Wyo., wanted to help a family after hearing of the devastation caused by the blizzard. Dax Dockery decided he would donate a heifer to a deserving youngster as a part of his Jr. Leader project. The winner would be chosen based on essay submissions. 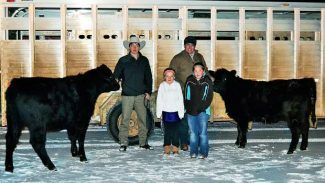 After hearing about his friend's idea, Monte Wade and his family decided to donate a second heifer. 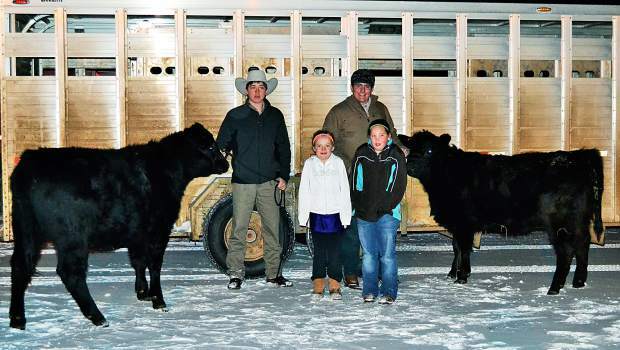 Laney (10) and Morgan (8) Mackaben were chosen to receive the heifers. Mom Shawnie had this to say about the delivery day, which took place Feb 8. "I would like to share a story about our girls and some very special and new friends in our life. Both Laney and Morgan wrote essays for the contest. They each won. Dax and Monte presented Laney and Morgan each with a heifer. They are two very wonderful and generous young men. Dax halter broke them for the girls so he knew they would be able to get along with them. We are proud to call these families from Lusk friends now and look forward to seeing them in the future. May God bless them and their generous hearts." Hi my name is Morgan Mackaben. Day 1: It was Friday October 4th. When I woke up it was raining with a lot of water standing in puddlies. At 6 a.m., it started snowing. Me and my sister Laney and my brother Clay and my mom went to my grandma's house to pick apples off the tree so the branches would not break. When we got home we shaked our trees for the snow to fall off and the rest of the day we spent around home. Day 2: I was up early. We grabbed our shovels and dug a path for my dad's feed pickup to get out of the backyard. As soon as we got out we headed to Wayne's to try and call in our cows to feed them but that did not go so well. We got stuck but we got out. We started the bobcat and tried to plow a path to the cows but we got the bobcat stuck too. We went back to grab the feed pickup to pull the bobcat out. I drove the bobcat when were trying to pull it out but when we got the bobcat out we got the feed pickup stuck. When it was stuck we had to put the wheel chains on it. We got out. After that we got the Honda stuck, then we went home and hooked on to the trailer and ate dinner, loaded the horses, went back out to Waynes and got the cows in the corral and fed them. Then we went to go save my stranded friends and then spent the rest of the day around home because the snowplows were not out yet. Day 3: It was already Sunday Oct. 6, and we went to Newell for the first day. But we had to follow the snowplows in so we would not get stuck. When we got out there we unloaded the horses and got all the cows off the road then we went into one pasture where we found a calf stuck in a snowdrift and the snowmobile had to pull it out. Then we had to push all the cows toward the gate so the tractor could feed them without getting stuck and I will remember my dad after our frist day at Newell. "Dad is my cow alive?" I asked sadly. "I don't know," he said, then he called Grandpa to see if he saw it at Union Center. Grandpa told Dad he saw a cows with two pink tags but not her calf. I was so happy but sad at the same time. Day 4: That morning we did not have school so we loaded the horses and went back to Newell. We went to one of Will Lindsey's pasture where we got all of our cows out of that pasture and into one closer to Will's barns. After that we went to go check on Will's 100 head of replacement heifers where we found my brother's calf dead. Day 5: We did not have school so we went to Newell again. That morning we picked up May Petrin and gave her a ride out there to help identify our dead cattle. Then I went to Union Center. At Union I felt sad but I felt so happy to see my cow alive but my calf was dead. My calf had died in the windbreak with about 30 more dead cows and calves. And then we spent the rest of the day out there. Wednesday we had school. Day 6: That day I skipped school and went back to Newell and we rounded up all the cows and calves and put them in Will's corrals and sorted them. We took all of ours to Foothills Feeders. My future plans with my heifer will be to show it at the fair and win rewards money for college. I also want to raise more calves off my cow at Union Center and build up more numbers for a small herd. Hi my name is Laney Mackaben. Day one: Friday, Oct. 4. I got up at about 6:30 a.m. I looked out the window and saw that it was blizzarding and water was standing in all of the water puddles. My dad said "you three kids should go clean off the neighbor's decks like always." After we got back, my grandma called and said that they have apples that need to be taken off the apple tree so that it does not break the tree. When we got home we had to put the goats in the barn. Then we spent all rest of the day at home worried and cleaning house. Day 2: Oct. 5. We woke up at 4:30 it was still snowing, we left and went outside and tried to get out of the driveway without getting stuck. We got out. We were going to go get the bobcat to bring home and scoop snow. We got out there and started the Big Red. We drove by the pond trying to find the cows. We got it stuck by the pond. So we went back and Dad hooked up the pickup and bobcat trailer while they were doing that I cleaned out snow from the peddles at the bobcat. Then my dad and sister took the bobcat while I was cleaning off the trailer. Then they came back and saw that they were stuck so we got the feed pickup to get it unstuck so we put on the chains so that we could get it unstuck. Then we loaded the bobcat on the trailer and went home when we got home my dad scooped us a trail to the horse trailer. Then my mom hooked it up to our other pickup and we ate lunch and left to go to Wayne's where the cows were. We found them and put them in the correl and fed them a bale then my grandpa came and we headed to Newell but at Nisland there were highlines on the road so we took the back road to Vale. There we had to pick up some family members that did not have electricity so my dad rode the horses in to pick them up so they had three people on my horse and one on my sister's. We went home and ate supper. Day 3: Oct. 6. The first day out at Newell. I woke up at 4:00 a.m. and went to Newell with the horses. A tractor was coming to us, we were told to keep stuff off the road so we loped all the way to Palo's Entrance. There was a lady behind 200 head of cattle. So I helped her push those in a gate then we worked back to Palo's cleaning stuff off the road. We did that all day. Day 4: Oct. 7. Today we started riding and saw where our main path of distruction was. My dad rode down to a dam he found my brother's red calf he gave him. My dad started crying when he got back to us. Then we rode around the pasture to find what was dead or alive. We rode down to a creek where there were 18 dead laying at the bottom with water flowing over them. Day 5: Oct. 8. Today we had to find Will Lindsey's yearlings we rode over by a cliff and saw a bunch or almost all. Then we drove up the road a ways where there were a bunch eating hay. There were some cattle coming toward us to put in that pasture so we put them in then my dad was talking to the people we had cows on Grassland LLC out of Bozeman, Mont. Day 6: Oct. 9. We went to school. Day 7: Oct 10. Today we had to sort the cattle between Ryan Larson, Jim Palo, Will Lindsey. Then the people that were on grasslands we would put in groups in an alley then sort them through a gate. We were done in an hour then we put them on trucks and took them to Foothills Feeders in Nisland. We gave them all shots so that they did not get sick and put them in a weaning pen. I will always remember feeling willing to get up early and help wherever needed during the storm and having to ride horse every day and see all the dead animals. My plans for the future with my heifer is to show it so many times to make it to state fair and win. Then have enough money to pay for college. It was really hard because they were wondering and trying to find there cattle that could be dead or alive. Essays were edited minimally for length.